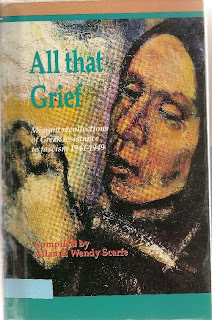 Here's another one - the book "All that Grief - Migrant recollections of Greek resistance to fascism 1941-1949" compiled by Allan & Wendy Scarfe. This was published in 1994 by Hale & Iremonger Pty Limited, Australia. There are 109 names mentioned in this book - you can view the names along with the Table of Contents at the HellenicGenealogyGeek.com page for "All that Grief"
Here is the synopsis from the back cover - "All that Grief is a collection of memoirs by 13 Greek resistance fighters now living in Australia. Caught in the Nazi occupation and then the Civil War in Greece, these survivors recount their own experiences and tell how the republican movement was destroyed, in the first conflict of the Cold War, by forces put in place by Britain and the United States. 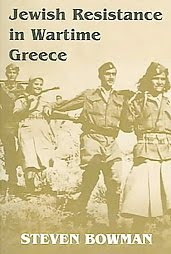 The book "Jewish Resistance in Wartime Greece" by Steven Bowman, University of Cincinnati. was published in 2006 by Vallentine Mitchell, London - Portland, Oregon. I am hoping that some of you can find this book helpful, it is full of stories and there are 876 names mentioned in the book - too many to post here, but you can view them on my website at http://HellenicGenealogyGeek.com on the page covering the "Jewish Resistance in Wartime Greece"